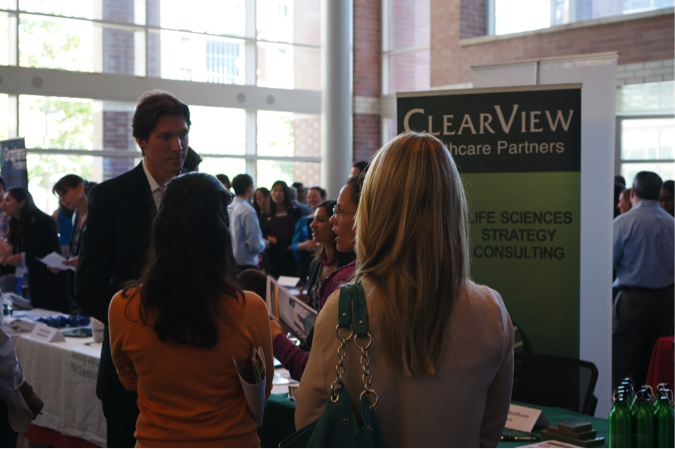 Find the next step along your career path at the Biomedical & Life Sciences Career Fair – it is the only one at Penn organized just for STEM PhD students and postdocs! Representatives from 33 employers are coming to campus to speak with you. 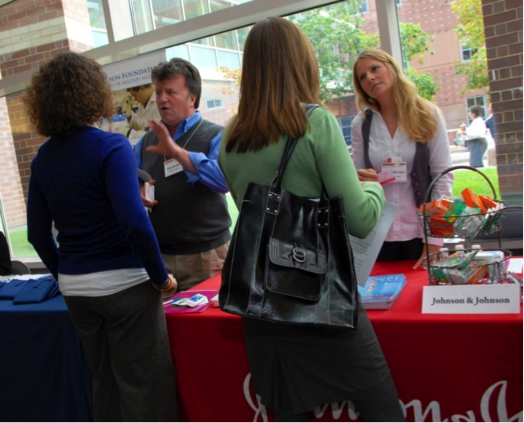 Career fairs are helpful to you no matter what stage you are at in your postdoc at Penn. It is very satisfying to see that Penn PhD students and postdocs find their next job through contacts they made at this career fair each year. Many employers bring Penn alumni and former Penn postdocs back as representatives for this event, and this is a great opportunity for you to listen to the advice they have for you. Find more information on who can attend, and to see up-to-date lists of registered employers and the schedule of employer information sessions given during the career fair, please check this page on a regular basis: www.vpul.upenn.edu/careerservices/careerfair/biofairstudents.php. 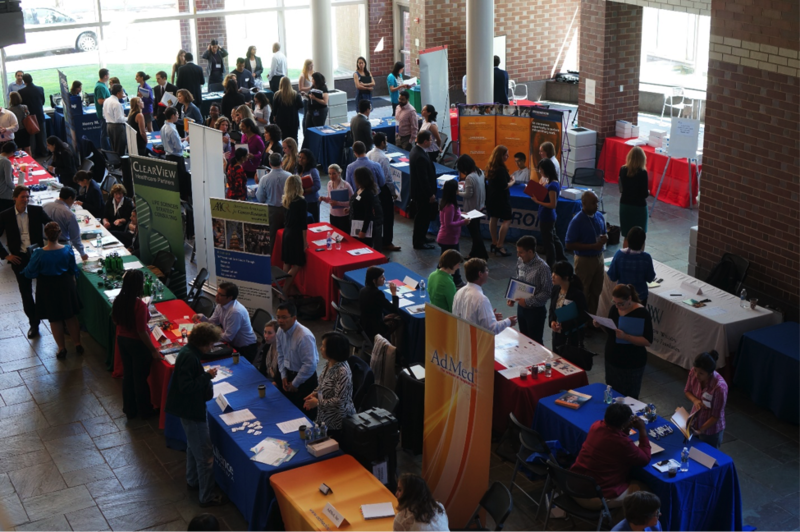 You might also enjoy reading about how to take advantage of career fairs even when you are not actively looking for a job: https://ulife.vpul.upenn.edu/careerservices/blog/2015/08/13/what-graduate-studentspostdocs-need-to-do-at-career-fairs/. If you have a TV, you’ve probably heard about SharkWeek, the DiscoveryChannel’s week-long programming each August dedicated to sharks, to help conservation efforts. You’ve probably also come across Wildlife Conservation Week, an annual event in spring to raise awareness for dwindling natural habitats. 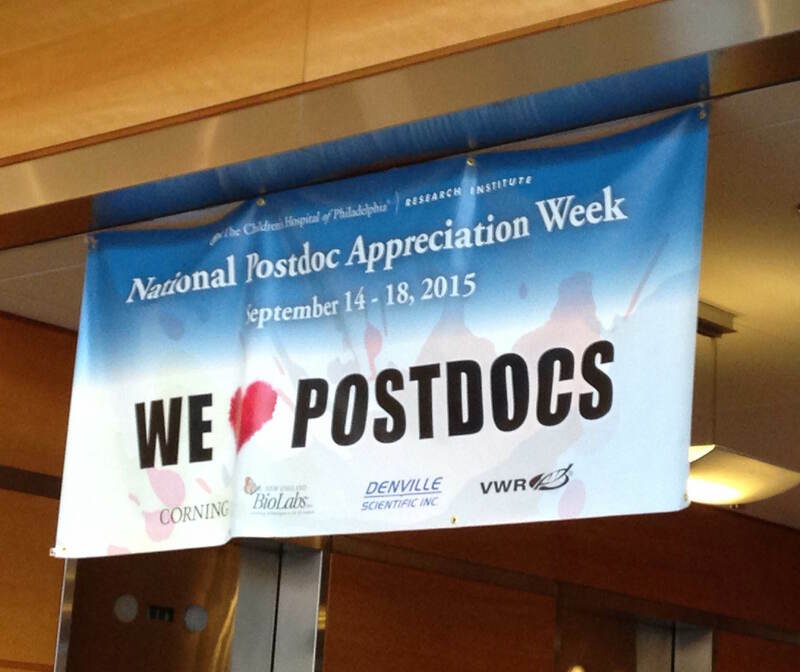 But did you know that this week (September 21-26) marked National Postdoc Appreciation Week? 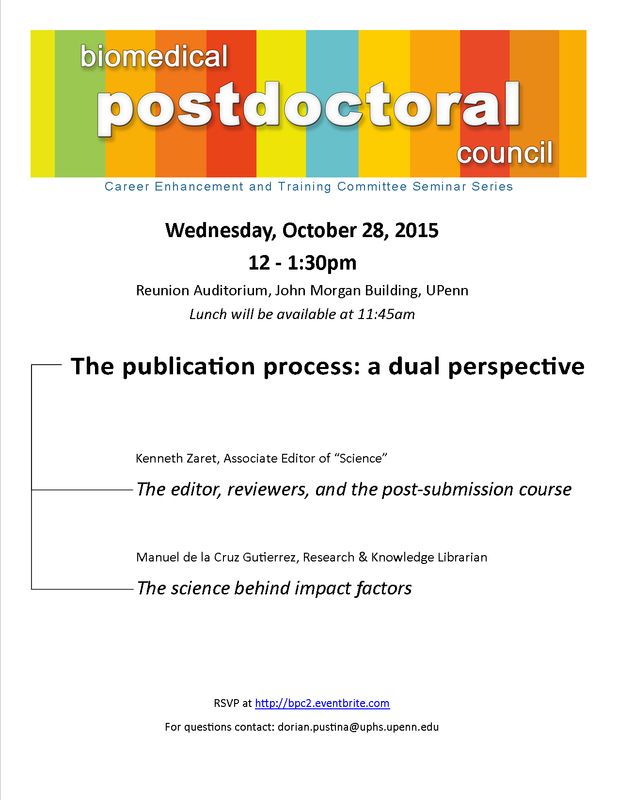 Similar to its namesakes, the aim of National Postdoc Appreciation Week is to create awareness. Certainly, postdocs don’t seem like a species in decline, but at many institutions their work and presence stays under the radar, and training opportunities remain limited. And so, to counter this trend, joining other universities and postdoc associations around the US, the Biomedical Postdoctoral Programs (BPP) at Penn and the Children’s Hospital of Philadelphia (CHOP) put together a wonderful series of events to celebrate and appreciate their postdocs. Due to the papal visit, the events on campus were held a week early this year, kicking off with talks and an ice cream social on Tuesday and closing with a reception last Friday afternoon. The events at Penn this year were focused on communication and career planning. As Morgan Kibler, Academic Programs Coordinator for BPP and one of the lead organizers, explained: “The events were designed to help the professional development of postdocs, to prepare them for formal and informal interviews, and how to communicate effectively in different settings.” Put together by Mary Anne Timmins, M.Ed., Administrative Director of the BPP and David Taylor, Ph.D., Assistant Director of CHOP’s Office of Postdoctoral Affairs, the program was intended to complement scientific training opportunities. Mary Anne told me their aim was to provide opportunities for postdocs to train non-academic skills before they need them, as they move to the next stage in their career. In addition to the talks and workshops, there were also plenty of social events, from ice-cream socials to a family BBQ and a closing reception, which provided platforms for postdocs to mix and mingle, and get to know each other. Six speakers at Penn’s “Wine, Cheese & Science” event squared off in talks designed to ignite curiosity and conversation about science. Have you ever wanted to know why some people get to enjoy ice cream while others are lactose intolerant, or why pills for different treatments also come in different colors? 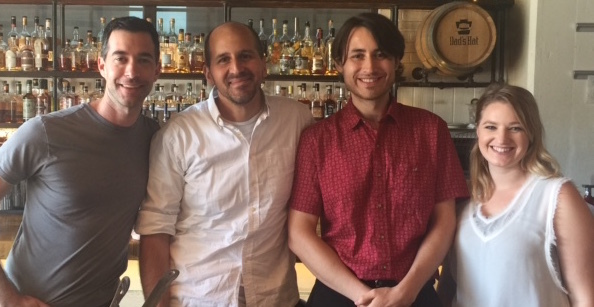 These and many other questions were answered by Penn and Children’s Hospital of Pennsylvania (CHOP) postdocs at the inaugural “Wine, Cheese, and Science” event. The Biomedical Postdoctoral Council (BPC) at the University of Pennsylvania hosted this event to provide an opportunity for postdocs to translate high impact scientific research in an engaging and accessible way for the general public. These TED-style talks are the first in a series of programs to address the growing need for communicating science to the public, and in turn informing the public of the impact of academic research on society. 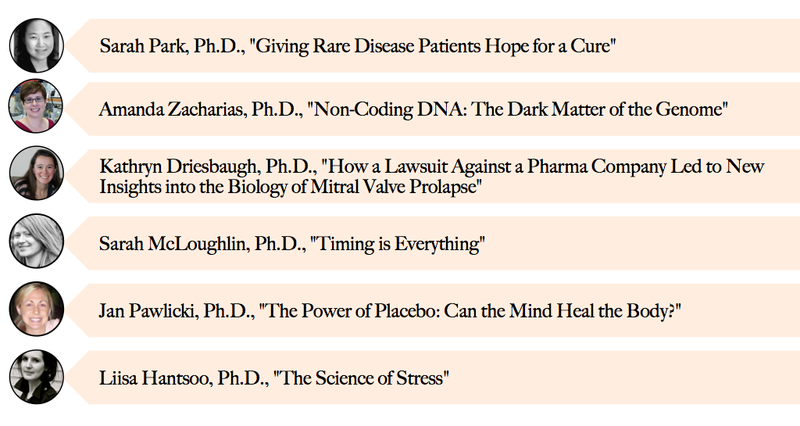 Six postdocs (listed below) squared off to compete for the coveted “best speaker” title, covering topics ranging from basic biomedical research to translational medicine, and how these areas of research inform human health and disease. While the topics varied, several unifying themes emerged. One such theme was the need to better understand the “unknown” functions of non-coding DNA, and how these regions of the DNA can often shed insight into human development and rare diseases. Perhaps lending some insight into our own busy and stressful lives as postdocs, the role of stress on our daily lives was likewise highlighted by several talks covering the impact of the placebo effect, sleep and circadian cycles, and immune response. As part of the speakers’ preparation, coaching was provided by experienced public speakers Dr. Amita Sehgal, John Herr Musser Professor of Neuroscience, and Helen Radenkovic, Director of Development for Companion Animals at Penn Veterinary Medicine . The coaches introduced the speakers to the skills and styles of presenting complex science in an accessible and engaging way to the general public. This approach is dramatically different than traditional science presentations, which is the focus of academic scientific communication. After the event, the presenters each expressed gratitude for the opportunity to reach a different audience with their science, and in turn it was clear by the audience’s response that the excitement and energy that each presenter brought to their talk was infectious. This was even more evident after the talks were over as the topics were on everyone’s tongue, in addition to the wine and cheese organized by the BPC Diversity committee and generously provided by Charles River Laboratories. 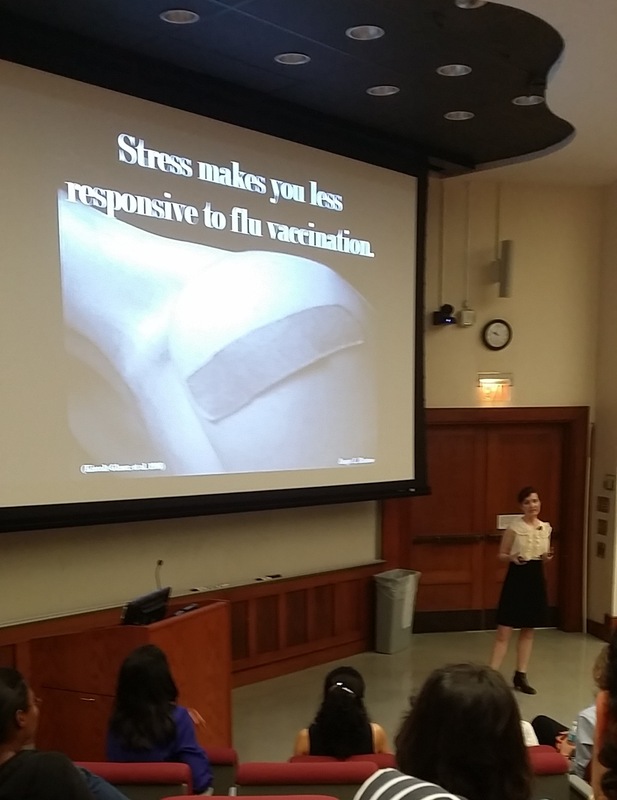 The winning talk, by Liisa Hantsoo, Ph.D. of Psychiatry at Penn, told a story of how stress can impact human health. The human body’s response to stress is the release of the hormone cortisol, which alters the body’s physiology, including immune function. This physiologic stress response is very important when we need to outrun a predator in a “fight or flight” response, but now stress encompasses our daily lives. Stress from work, family, school, and even the morning commute are interpreted by our bodies the same way and can place us in a chronic state of stress. Dr. Hantsoo went on to relate how waves of stressful periods of time can impact a wide variety of processes including the ability to combat illnesses like the flu and cold sores, as well as wound repair. Dr. Hantsoo finished her talk by discussing how better understanding our body’s response to stress and other stimuli will impact how we are able to treat diseases. If you missed out on this event, come out next year when we roll out another edition of this highly entertaining event, and stay tuned to the BPC for upcoming events highlighting scientific communication in the coming months. 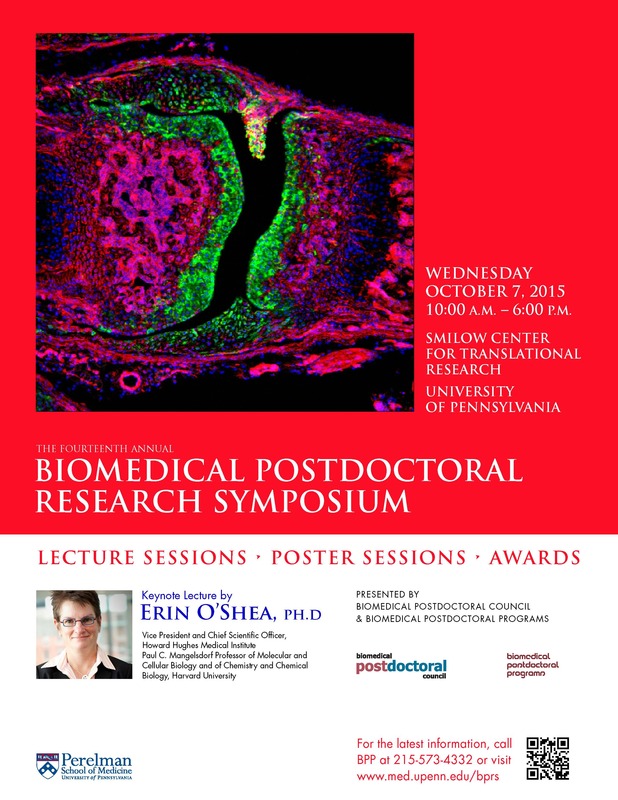 This year’s Biomedical Postdoctoral Research Symposium will be October 7, 2015 from 10 a.m. – 6 p.m. The event showcases research being done by biomedical postdoctoral researchers at Penn. We hope you can join us! At the start of every academic year I get really excited thinking about the rush of scientific and social happenings I know are roaring back into full swing after the typically quiet days of summer. Adding to the roster is a suite of events brought to the larger scientific community by the passionate postdoc volunteers of the Biomedical Postdoctoral Council (BPC), who go into overdrive to kick off the year with our Research Symposium, social mixers, career trainings, and other programs. 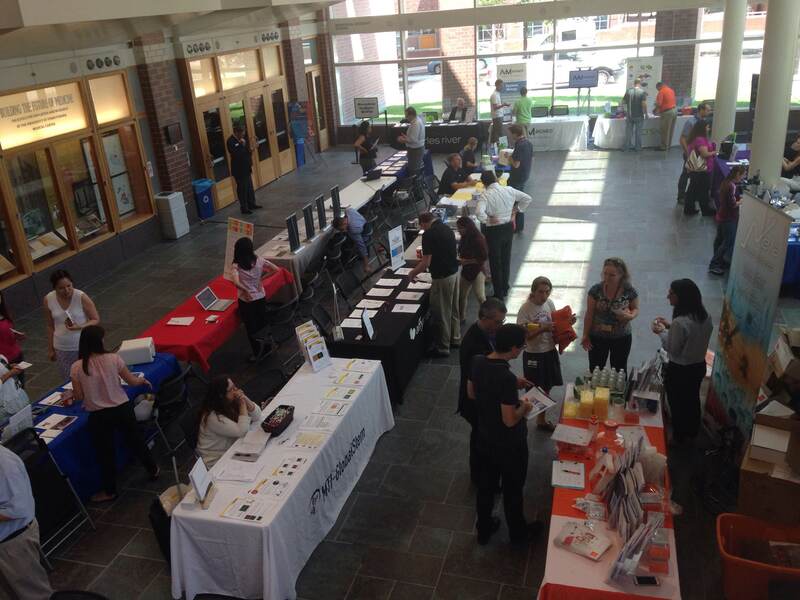 The starting lineup of BPC events began with our Vendor Presentation Fair, which happens biannually and most recently was one of our largest to-date. The fair is the BPC’s primary fundraiser, but it serves a larger role than just a revenue generator. Chief among them is facilitating relationships between vendors and researchers. Of the hundreds of attendees, nearly a third started on campus in the last six months and came seeking the tools and services they need to begin their projects. A common misconception of vendor fairs is one of aggressive sales people pushing their wares and spamming us. The reality is very different. To quote William Dombro of Worthington Chemical and participant in this last fair, “We know how to get orders prioritized, we know who to ask for technical information, we are able to find out-of-date parts, and when you are ready to move on we know who the good recruiters are.” In other words, the nature of their business is to make sure we succeed, and to do so they listen to our scientific problems and connect us with relevant resources. In my own experience, I have often been connected through vendors to other researchers on campus who have used similar technical products and are happy to share their knowledge. Beyond connecting scientists with vendors in an authentic way, there were also several raffle prizes up for grab and one lucky winner got a FitBit grand prize and a chemistry cocktail set. And of course there was a metric ton of pizza, the ultimate marketing tool to attract scientists. The team is looking forward to next fair and all the great events the BPC is hosting this year. The 2015 BPC Vendor Presentation Fair organizing committee. The vendor fair has been dependably steered for years by Terry Cathopoulis who worked closely with the other members of the team: Morgan Kibler, Thomas Porturas, and Zev Einhorn. Do you like your science bold, bright, complex? Funky, peppery, or intense? With a smooth finish? Attend our series of TED-style talks. Hear postdocs present scientific research that’s juicy, lively, sharp. Never dry or sour. Choose your favorite. Then chat with them at a wine and cheese event to follow. Wine and cheese reception co-organized by the BPC Diversity Committee and BPC Newsletter, with generous support from Charles River Laboratory. 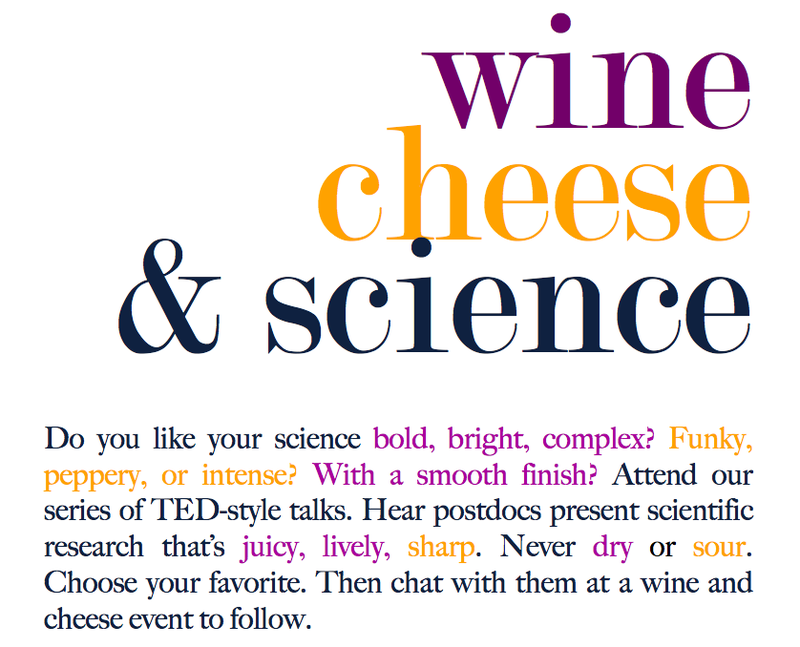 Please RSVP here by 9/8/15: https://www.eventbrite.com/e/wine-cheese-science-tickets-18314027750.